If the 2017/18 season had started on March 4th – the day Paco Lopez took charge at Levante UD – they would’ve been crowned LaLiga champions. Only FC Barcelona have taken more points since his arrival, and only they and Real Madrid have scored more goals. The Valencian side have also won in the Bernabeu, ended Barça’s 43 match unbeaten run and beaten European aspirants such as Real Betis and Sevilla FC in that time. Their turnaround under Lopez has been remarkable, but what are the secrets behind their success? At 51, Lopez had no prior experience managing in LaLiga before taking over at Levante. However, he learned his trade in Spain’s notoriously difficult third and fourth tiers, and was given a chance with the first team on the basis of an impressive campaign with the club’s reserve side. Originally seen as a short-term solution, his job was made permanent following an excellent start that saw him take 22 of the first 27 points available to him. Levante had won just 1 of their 22 matches before Lopez’s appointment, compared to 13 of 22 now with him at the helm. Lopez was born in Silla on the Costa Brava, coming through the ranks as a youngster with Levante’s local rivals Valencia CF. However, he played for los Granotas back in the 90s and has spent the majority of his footballing career in the Valencian community. The core of his team is made up of local players. Roger Marti, Toño, and Pedro Lopez all hail from the region, whereas Jason Remesiro and club captain Jose Luis Morales came through the B-team. Morales is the heart and soul of the team. Nicknamed ‘the commander’, his never say die attitude embodies what Levante are all about. “An example of commitment in our dressing room” is how Lopez describes his presence. Every commander needs a lieutenant, although striker Roger Marti is much more than that. His goals helped earn promotion back to LaLiga Santander in 2017, but in recent months he’s moved his game up a level, having scored six goals so far this season. Enis Bardhi provides the class in midfield, and he is one player that Lopez has shown particular faith in. The 23 year-old hadn’t started a league match in 2018 until the change of manager, but is now a mainstay in the XI. Reknowned for his free-kicks – Bardhi has scored six times from dead ball situations since moving to LaLiga last year – he’s also a willing runner, and has improved especially in terms of his off the ball involvement in Lopez’s time at the club. In Jose Campaña, they have an all-round midfield general whose best years are still to come. A European champion at youth level for Spain, Campaña has a bit of everything to his game and along with Morales is the only outfield player to have started every match in 2018/19. Lopez has altered Levante’s tactical dynamic on a few occasions. One of the first changes he made was to switch from a 4-3-3 formation to 4-4-2, but after a recent dip in form he experimented with a 3-5-2, which helped see them return to winning ways. The counter attack is perhaps his most deadly weapon, with the pace and trickery of Morales an obvious threat. That’s not to say that Levante are a defensive team, quite the opposite in fact. They’ve conceded more shots than any other team in LaLiga this season, which shows the merit of goalkeeper Oier, a Barcelona youth product who has established himself as the number one under Lopez. The manager has a settled XI flanked by solid reinforcements from the bench – every player knows their role both in attack and defence. They play without fear regardless of the rival, and have a strong union with the fans at their Ciutat de Valencia stadium. 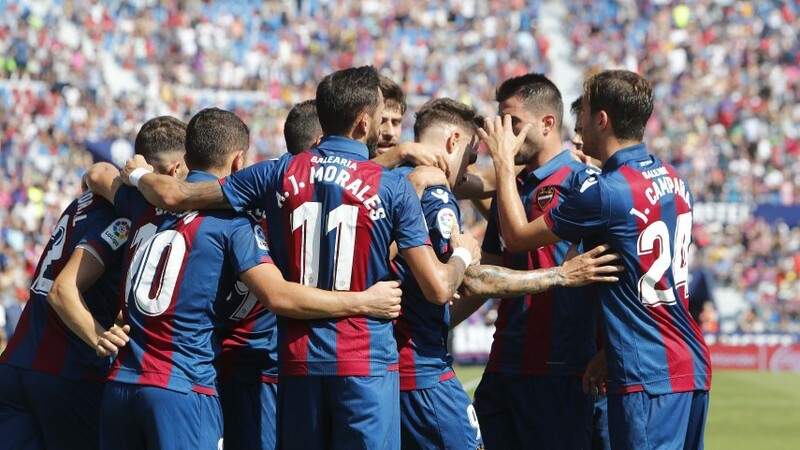 Best summed up by the captain, "[Levante] are a brave, confident team that plays with passion and a will to win." Currently 7th in the LaLiga Santander standings, Morales and co. are looking forward as they head towards the conclusion of an historic 2018.